Tangut’s 2017 J-Term: DPMI in Monterey. 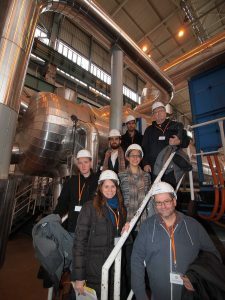 In January of 2017, nine MIIS students traveled to Prague and Vienna to attend the first Nuclear Research Reactor Practicum. This program was created in conjunction with MIIS and the Czech Technical University (CTU) to help bridge the technical gap often experienced in policyoriented students’ educations. Dr. Lubomir Sklenka and his colleague, Judy Vyshniauskas, traveled to Monterey last year to explore opportunities for cooperation between MIIS and CTU. Dr. Jeffrey Knopf, Dr. George Moore and Carolyn Meyer teamed up and the two groups of academics crafted a comprehensive program that included lectures, experiments and day trips to additional nuclear facilities. Joe Brazda, senior manager at the James Martin Center for Nonproliferation Studies (CNS), worked closely with Dr. Sklenka and Mrs. Vyshniauskas to create an internship program for one student from the course who would then stay in Prague to conduct research at the reactor. The curriculum, spanning a period of two weeks, was comprehensive in its scope. Students attended lectures whose topics included nuclear safety and security, safeguards, research and power reactor construction and operations, front and back end of the nuclear fuel cycle, emergency preparedness, radiation protection and waste management among a host of other issues. 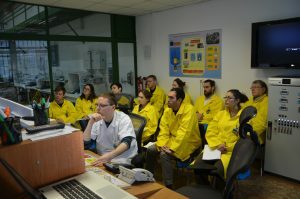 The reactor division team at CTU rotated their lectures as different scientists presented their research in areas of reactor operations and management for both research and power reactors. It was clear the CTU team spent an enormous amount of time preparing the material and presenting it in a fashion that students from a non-technical background would understand. In addition to the series of lectures, Dr. Sklenka and his team guided the students through a number of hands-on experiments utilizing the VR1 Sparrow reactor located on campus. At the operator’s station in the control room, students were shown how to manipulate the reactor’s control rods in an experiment on how to reach pre-determined power levels. Once the process was fully demonstrated, and training was provided on how to read the information displayed on the room’s monitors and gauges, each student was allowed to sit at the operator’s station and individually manipulate the reactor. During a neutron activation analysis experiment, a sample of material was placed into an experiment tube and lowered into the reactor where it was irradiated. This sample was then placed in a high purity germanium detector (HPGe) where its gamma ray radiation was analyzed against an online database to determine the composition of the sample. In yet another experiment, students learned about the distinction between prompt and delayed neutrons and the role they play in a reactor. More than 99% of neutrons in the fission process are prompt, meaning they are released immediately after the fissioning of an atom. Although delayed neutrons, which are released very shortly after prompt neutrons, are only a small portion of the neutrons in a reactor, a reactor would be uncontrollable without them. These hands on experiments brought a level of clarity to research reactor applications that could not be attained through lectures alone and greatly enhanced the learning experience for the students. Dr. Sklenka arranged for a number of day trips to nuclear facilities located around the Czech Republic. The first journey involved a train ride through the Czech countryside to the Rez Research Center and reactor complex. The students were guided throughout the complex and were given presentations on its LR15 research reactor and a LR0 zero power reactor. Students were allowed to stand on top of the LR15 reactor vessel and peer into the core where the fuel assemblies glowed blue due to the presence of Cherenkov radiation while a reactor Director described day to day operations. They were then taken to the zero power reactor where scientists conduct experiments using molten fluoride salts as a primary cooling material in nuclear reactors. The afternoon was then devoted to presentations at the National Radiation Protection Institute where scientists and engineers monitor the Czech Republic for radiation incidents as well as conduct testing and analysis on anyone who might have been exposed to radiation. The second day trip involved a trip to Skoda nuclear reactor production plant and a cultural event. Skoda is a massive industrial complex in a town named Pilzn that manufactures nuclear facility components, fuel management casks, fuel replacement rail vehicles and many other large industrial materials. A representative from Skoda gave a brief presentation on the company then led the students on a tour of a building where reactor vessels were produced as well as spent fuel casks. Reactor vessels hold the fuel assemblies and weigh up to 440 tons while spent fuel casks can weigh 70 tons, even without the two lids used to shield the fuel and seal the casks. The scope of nuclear facility production was well demonstrated and the student’s knowledge of how spent fuel is managed was significantly increased. The day did not end there. The guide then brought the students to the Pilsner Urquell brewery where they were provided with lunch, a tour and subsequent beer tasting! The third and final day trip appeared to be the most popular with the students and was a unique and rewarding excursion. Dr. Sklenka used his relationship with the Temelin Nuclear Power Plant management team to provide the students with a tour of the facility along with three presentations covering issues in nuclear power plant management, long-term energy planning and the training and experience required to become a nuclear power plant operator. Temelin is an impressive facility with two 1000MW light-water power reactors and four cooling towers that provide 20% of the electricity consumed in the Czech Republic. The tour and presentations were followed by a comprehensive orientation in the facility’s simulation control room. The simulation control room is designed to replicate the actual control room in every detail in order to certify new operators and conduct training in nuclear safety and security. The guides described the control panels and the layers of safety mechanisms involved in their safety programs to ensure safe operations in case of an incident. One student was asked to switch off a portion of the simulated cooling system which resulted in a series of control rods automatically dropping into the fuel assembly in order to reduce power. Another student SCRAMMED (to instantly shut down all power) by pressing and emergency switch and dropping all control rods in the reactor vessel demonstrating what operators would do if a complete shut-down became necessary. This type of hands-on learning was invaluable and the students agreed visiting Temelin was a highlight of an already amazing practicum. Dr. Sklenka concluded the course with an exam and a Q&A with the students so he and his team could find ways to improve the program. It was a fruitful discussion and the students and CTU team bade each other farewell so the students could travel to Vienna for the last day of the practicum. The CTU team and MIIS students had clearly become friends and everyone agreed the practicum was a great success.